ROAD TOWN, Tortola, VI- On January 7, 2018, around 7:45 P.M., according to the Puerto Rico Seismic Network, an earthquake measuring a magnitude of 3.70 occurred in the vicinity of the Virgin Islands. 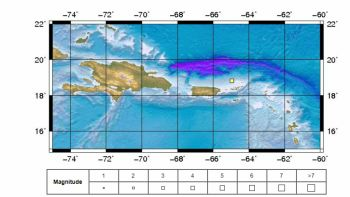 The epicenter was located at latitude 18.83, longitude 64.94 or approximately 57.81 km North West of Road Town, Tortola, VI at a depth of 14.2 km. No tsunami watches or warnings were issued for the VI from this event. The Department of Disaster Management (DDM) takes this time to remind the VI community that we live in a seismically active zone, which makes the Territory vulnerable to earthquakes. that's nothing, not even a burrito fart. just wait what's in store very soon.